Hope you all had fantastic Halloween day yesterday! I don’t celebrate Halloween but love to see everyone dress up and celebrate. Looks like lot of fun and hope you had fun as well. 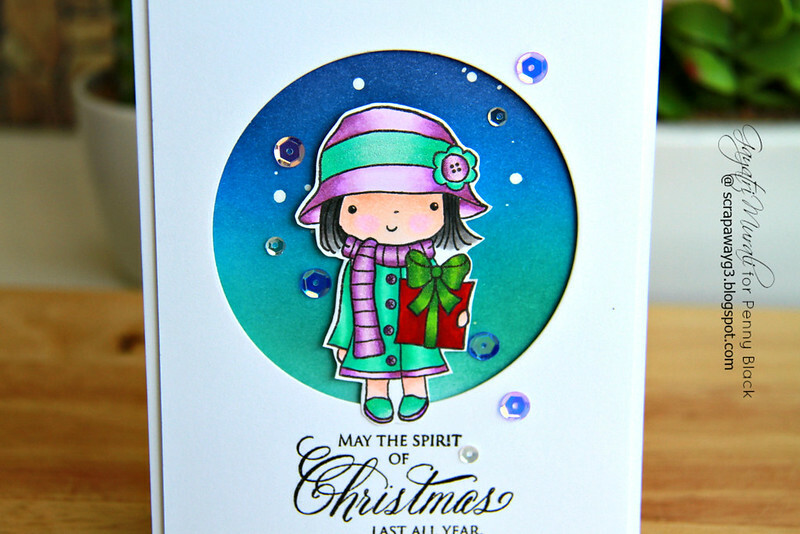 Today, I am sharing with you a Christmas card using Penny Black Christmas release stamp sets. The focus of this card is this pretty girl image from Twinkle & Wish stamp set.I stamped, copic coloured and cut the girl out by hand. Then on a white cardstock panel, I die cut a circle and stamped the sentiment from Season’s Gift stamp set below the circle window. This is my window. On the card front, I spattered masking fluid, then masked the edges and sponged Evergreen Bough, Mermaid Lagoon and Chipped Sapphire distress inks. I removed the masking fluid spatter. I adhered the window panel using foam adhesives and the girl image on the window using foam adhesive as well. Finally I embellished with Blue Lagoon and Lavender Moon iridescent sequins and Sparkly Clear sequins from Pretty Pink Posh. Here is a closeup of the card. Here are the two stamp sets I used to make this card. Gayatri, this card is extraordinarily beautiful! The colours (and your colouring) are amazing! Beautiful card!! Love your coloring of the girl! !